1. It’s a great way to get outdoors. Suffering from a lack of vitamin D from sitting at your desk? Getting out in nature lowers your blood pressure and improves your mood. 2. It’s a great way to unplug. Phones, iPads, computers, and water don’t mix well. 3. It’s active. Sailing helps to improve your balance, and you also work your arm muscles while hoisting and trimming sails: all good, doctor-approved exercise. 4. It’s best shared with friends. There are some adventurers who prefer to explore the watery world solo, but the rest of us go sailing with friends and family. 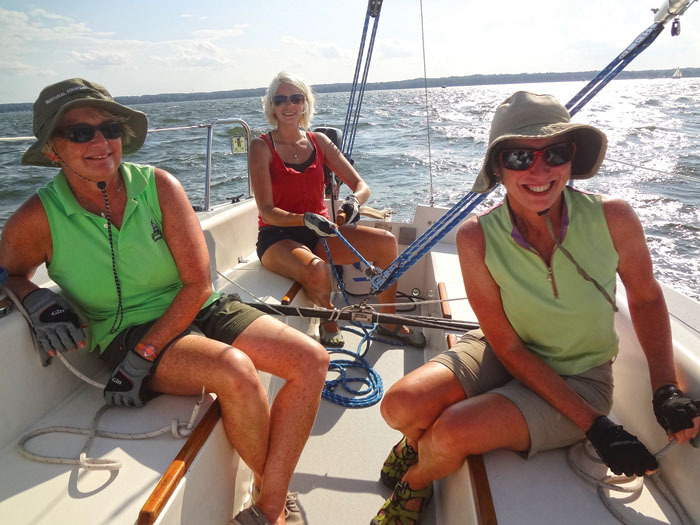 Sailors often say that the sport fosters lifetime friendships and lasting fond memories. 5. It’s intergenerational. In some families, the grandparents teach the younger generation to sail. In others, the young people take their parents or grandparents out sailing. It’s a very family-friendly sport (see page 30). 6. It’s green. Sailboats are powered by the wind, which is still free. Even sailboats with engines require very little fuel. 7. It’s exciting. The wind in your face, the sound of waves splashing under you, sunlight glittering on the water… sailing can be exhilarating! 8. It’s relaxing. Some days on the water can be very quiet. Just a little breeze and the calming sound of the water… ah. 9. It’s challenging. Although you can learn the basics of sailing in a short time, there is always more to learn. It’s a great sport for keeping your mind active. 10. It’s fun. Who doesn’t want more fun in their lives?